FUM B1 has been proven to cause liver and kidney damages. Fumonisins (FUM) are mycotoxins produced by some Aspergillus and Penicillium species. FUM B1 is the most common and important fumonisin. 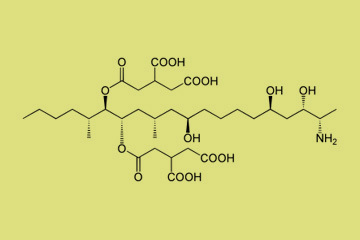 It acts as an inhibitor of ceramide synthase and prevents the biosynthesis of membranes. FUM B1 has been proven to cause liver and kidney damages in all animals tested so far. Within the context of consumer protection, it is therefore necessary to monitor the production of food and feed and to check its content of fumonisin. A list of currently available aokin Fumonisin products can be downloaded here.